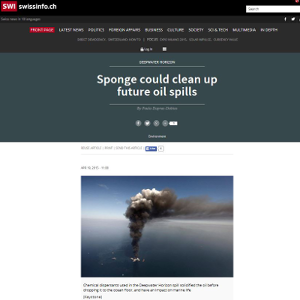 A Swiss-developed sponge that one day could take on oil spills like the BP Deepwater Horizon disaster of five years ago has taken a step closer to industrial use. The Deepwater Horizon spill deposited an estimated 16-20 million gallons of oil on the floor of the Gulf of Mexico, including what scientists have called a “bathtub ring” some 3,200 square kilometres in size, according to the results of different studies. Such “mats”, reportedly formed after chemical dispersants Corexit 9500 and 9527 solidified the oil before dropping it to the ocean floor, deprive subaquatic areas of oxygen, rendering it more difficult for bacteria to decompose the oil. And pieces of these toxic mats regularly appear on shorelines and beaches following strong weather fronts.